The 27th annual Nittany Valley Half Marathon saw record numbers of participants: 784 registrants and 654 finishers. These far exceeded last year's records: 563 and 452. Why such an increase? I don't know. It certainly wasn't the weather, which saw temperatures in the 20s and a few snow flurries. On the other hand, snow did not cover the course as has happened in a few recent years. The record turnout enabled us to send a nice check for $5500 to Centre Volunteers in Medicine, which serves the uninsured or underinsured of Centre County. The men's winner, A J Kelly of Altoona, held back early and then took a lead that ended up as over a minute. The women's winner, Cassi Knight, was more dominant, by almost three minutes. Thanks as always to a great group of volunteers: Pre-race packet stuffing and registration: Michael Goldfine, Paul Jech, Tom Cali, Cheryl Capone, and Michelle Hutnik. Race-day registration was headed up by Cheryl and involved Rich Olsen, John Wilcock, Erin Nelson, Megan Monroig, and Michele Whitcomb. On corners out on the course: Lance Bland at Rock/Houserville, Kim Gasper at Orchard/Puddintown, Judd and Davis Michael at Houserville/Puddintown, Michele at Orchard/Park, Tim Richardt at Park/Potter, and Erin and Tim Scitti at the final corners of the "spiral of death." Someone chalked that epithet on the pavement, apparently referring to the spiraling hill that starts at the bottom of Orchard Road and ends at the finish line. I actually designed the final spiral to mimic the Marine Corps Marathon that, from mile 26.0 to mile 26.2, spirals up and around the hill that contains the Iwo Jima Memorial. I ran up that hill three times. All three times it seemed never to end. The "inside people" were Stevie Rocco and Megan, who picked up Subway sandwiches and oversaw the food area. Stephanie Frey and Brent Veshecco were my "personal assistants," helping deliver stuff to water stops and then doing whatever needed doing. Stephanie, Brent, Megan, Michele, and Tim Richardt were all students from a Kinesiology class who were great volunteers and who all stuck around for the final job of any race - picking up and hauling trash to the dumpsters. Tim Scitti picked up food at Wegmans. 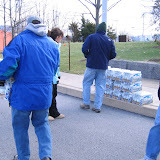 Jan and Larry Miles were at the finish line, handing out water and clipping chips. At water stop #1 were Beth, Greg, Sarah, and Allie Scott, Jeff and Abby Bettwy, Kathleen Shupenko, and Heidi Lewis with three daughters. The team at stop #2, at the airport corner, was Melissa Aukerman, Teresa Timmerman, Tara Murray, Sally Bondurant, Svend Pedersen, Grace Small, Katrina Bautista, Dawn Maguire and kids, Liz Haushalter and kids, and Kristie, Kylie, and Andrew Kaufman. At stop #3 were Sue and Maddie Brindle and John Sheakoski. Marvin Hall, as always, is the key to the whole operation, reserving us the Ag Arena, opening and closing it, and then working Saturday and Sunday as well as running the race. Mike Casper designed the shirt, for which Kathy Simin was the model running up Orchard Road with Beaver Stadium in the background. Our sponsors are Coca-Cola for water, ProCopy for applications, Rapid Transit and Wegmans for bags, and Tom Cali, the running realtor. I sent a bulk email after the race asking for feedback. Comments were varied but uniformly positive about the race. Based on the feedback and my own philosophy, I intend to keep it as a "few frills" race: low fee, no bibs, no finishers medals, no monetary prizes, no invited runners, no big expo, relatively few water stops. We will make sure that portapotties for the Ag Arena that did not arrive this year will arrive next year. I may add an option for a long-sleeved technical shirt as well as 100% cotton. We'll consider moving the airport water stop a half mile further down the course to a sheltered spot on Spring Creek. Volunteers this year at that stop heroically held blankets to keep cups from blowing off the tables. Maybe we'll add some portapotties to that water stop. We may add a fourth stop. I'll get more bottled water for the finish line. Of course, this race being this race, there's always a chance the water will freeze within the bottles. Who'd hold a race in December in central Pennsylvania, a half marathon even? How many would come out? A hundred, maybe?